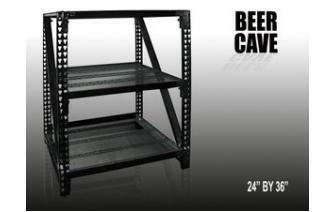 Beer Cave Shelving System. The New Industry Standard for Beer Caves. Available in various dimensions to fit your custom configuration. 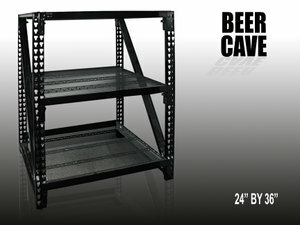 The First to develop the Original Beer Cave Shelving, it's toughest and most heavy-duty shelving system in the ADCO line, with up to 2700 lbs. storage capacity (900 lbs. per shelf)! Power-coated black steel frame construction is chemical and chip resistant – and guaranteed to last! Shelves are constructed of 31 crossbars per foot (compared to half that on other brands), ensuring products stay in place and don't tip! Easy-to-adjust brackets make changing shelf position a snap; and shelves drop easily into slots (adjustable to 27 different heights, 2” increments). U-brackets and adjustable feet provide added stability (casters also available). 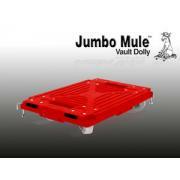 Available in four different dimensions to suit any storage need! Changing the way cooler vault products are stored, ADCO Shelving systems have earned the highest rating for cold storage from the National Sanitation Foundation (NSF). 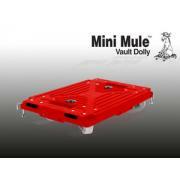 Ideal for commercial storage (cold-vault and display) and also the home (garage, laundry room, office, workshop). Works in conjunction with other ADCO Shelving and Dollies for the optimal storage system!